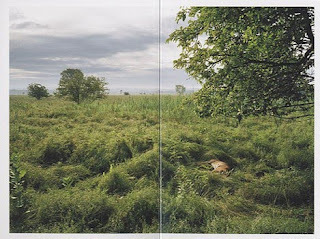 Phil Underdown's new Limited Edition 'Grasslands' has appeared in the photo-eye bookstore! This beautiful 4x6" artist book (limited to 50 copies) is the 5 year documentation of the Shawangunk Grasslands National Wildlife Refuge, which once existed as an airstrip. It now exists, as Underdown puts it, "in a hybrid state. Like an imitation of a natural landscape, it attempts to be something that it never was, and can't be without constant intervention." This little hardbound consists of 23 full page illustrations. There is much to contemplate regarding Underdown's new Limited Edition, stay tuned for my up-coming review in photo-eye Magazine. You can also find additional information and a purchasing price by clicking here.